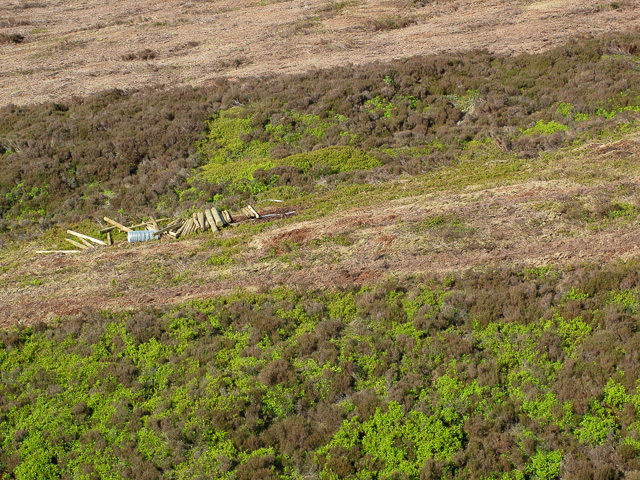 Loop-holes being used by many moorland keepers to deter raptors from settling on moorland in Lancashire’s Forest of Bowland:More shocking images. In 2006 the North West Raptor Protection Group highlighted a legal strategy being used by shooting estates in Lancashire’s Forest of Bowland to deter raptors from returning to nest at traditional breeding territories, particularly at ground nesting sites. 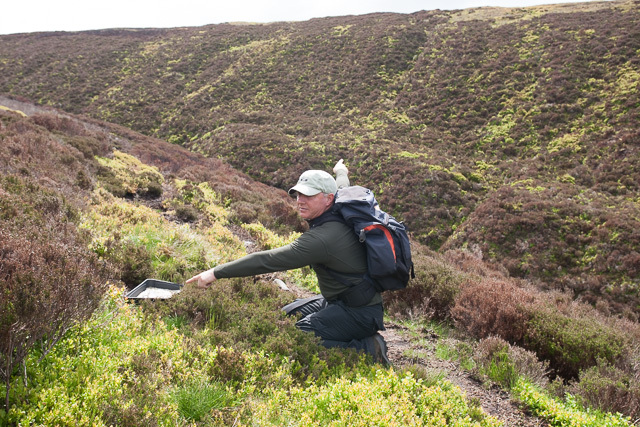 Gamekeepers from a number of estates are strategically placing grit feeder trays filled with medicated grit used to treat worm infestations in red grouse, together with tunnel traps deployed to kill vermin adjacent to peregrine nesting sites. This year both in Scotland and in the northern Pennines, gamekeepers used gas guns to frighten off hen harriers from moorland as pairs were prospecting for a nesting sites. 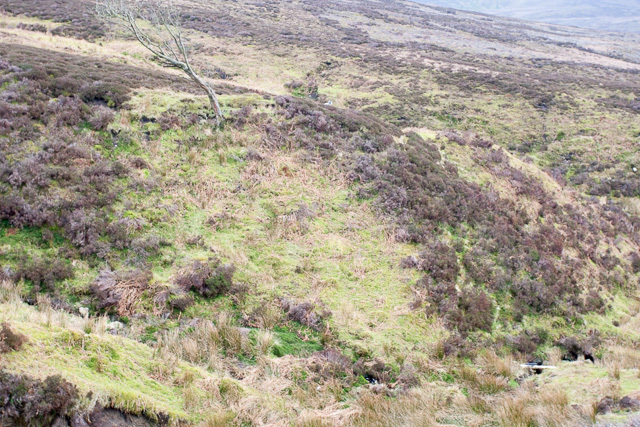 Forest of Bowland 2014: Stream gully often used by ground nesting peregrines. Now surrounded by grit trays on right hand side of gully. If you look carefully top left hand side of nesting gully, you can see stock fencing installed by estate in May 2009 just as clutch of eggs were hatching. See below for more shocking images taken in 2009 which would have resulted in nest failure had this installation not been halted by local raptor group. May 2009: Estate choose this critical time to install stock fencing near nesting site containing 4 eggs just hatching. Helicopter used to ferry materials onto opposite side of gully causing eggs to be blown out of nest scrape. Members of the North West Raptor Protection Group on hand to stop this illegal activity proceeding. Two chicks survived, two eggs containing dead embryos found. Path used by gamekeeper leading to Grit tray installed 75 metres away from occupied peregrine nest located in deep heather on far side of stream gully. So concerned at the serious negative implication for ground nesting Schedule 1 raptors in Bowland, the North West Raptor Protection Group brought the matter to the notice of both the RSPB and United Utilities on who’s property many of these installation were being discovered. It was pointed out to both parties during a joint raptor liaison meeting, that under existing legislation gamekeepers have a statutory duty to inspect each trap installed once every 24 hours. This activity could result in illegal disturbance to occupied sites when they are being visited so often. Grit trays are normally refilled on a regular basis during the breeding season but visiting these trays to refill them would likewise also pose a distinct possibility of disturbance to any breeding raptors nearby. Quite obviously during the breeding season where a trap or grit feeder had been installed, instances as close as 50 metres have been recorded, no visits should be undertaken because disturbance to breeding birds at that time of the year. We are reliably informed the concerns raised by the NWRPG were dismissed. Since 2006 this practice now extends across the whole of Bowland encompassing the majority of abandoned and known peregrine nesting sites in the region. In 2009, twenty five peregrine territories were inspected by the NWRPG in the Forest of Bowland. Seventeen were occupied, six sites failed following the curious disappearance of eggs and chicks. A total of eleven territories were productive, fledging 24 chicks. This result was considered by the NWRPG to have been a very poor breeding season. Two large female chicks disappeared from a brood of four within 24 hours of being rung. 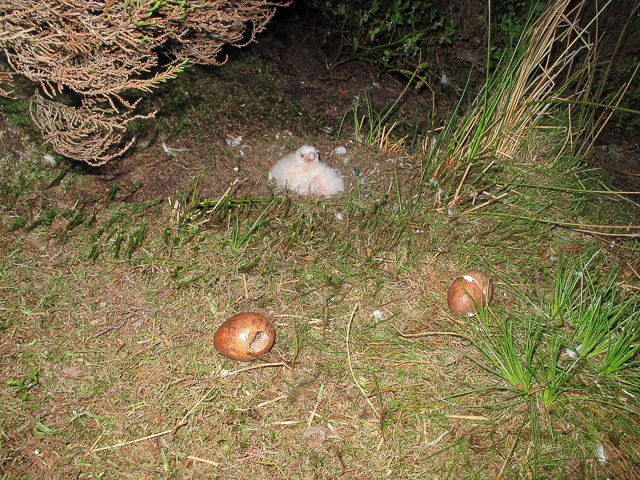 In 2013 only four occupied nests were recorded in the whole of the Forest of Bowland; one nest failed at the egg stage, a second clutch of eggs disappeared from the nest, a third nest located close to a grit tray failed at the egg stage following a number of visits to the site by an estate keeper. The fourth occupied site, the only successful nest in the Forest of Bowland, was established on the United Utilities estate. 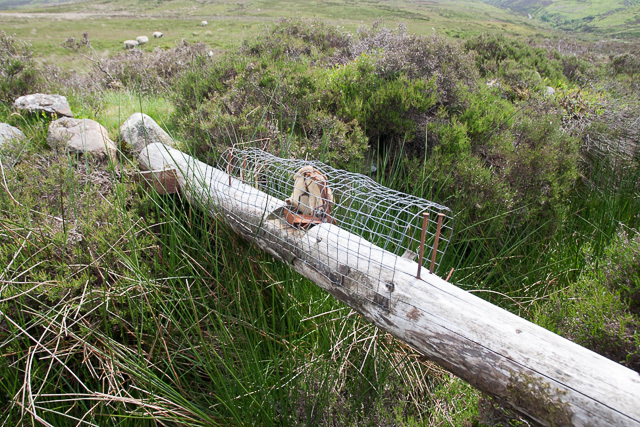 As described above, where an occupied peregrine territory exists, even though gamekeepers are well aware it is illegal to visit a trap or any grit tray during the breeding season, some keepers are still willing to break the law regardless of any legal consequences. Moorland gamekeepers are fully aware they are able to get around this by making regular visits to their traps or grit trays in the early spring on a daily basis before the falcons begin to breed. By adopting this subtle approach, prospecting falcons returning to reoccupy a breeding territory are then persuaded from settling, or much worst treated to a more final solution. One of 12 tunnel traps examined, each set 200 metres apart along a stream bed where peregrines held a territory. This trap contains a dead stoat. Having raised this issue with a rural police officer we are advised if the gamekeeper adopts the latter approach in the spring moving on a pair of falcons before settled down to breed resulting in the territory being abandoned, even if the birds are then moved on by this action, no offence is committed. We remain unconvinced, what are your views, what do you think, especially as there appears to be a certain amount of premeditation on the part of a some gamekeeper to get rid of peregrines? If such a management strategy was ever implemented throughout the whole of England’s northern uplands, grouse predating birds of prey which nest on moorland where red grouse are shot, will almost certainly disappear completely from these regions in the very near future without anyone committing an offence. This year moorland estate gamekeepers went one step further by deploying gas-guns to frighten away hen harriers on the Leadhills estate in the Scottish Borders and on the Croglin estate at Geltsdale in the northern Pennines. It seems this new scare strategy is perfectly legal enabling estates to deter protected birds from breeding on their moorland properties without being prosecuted. 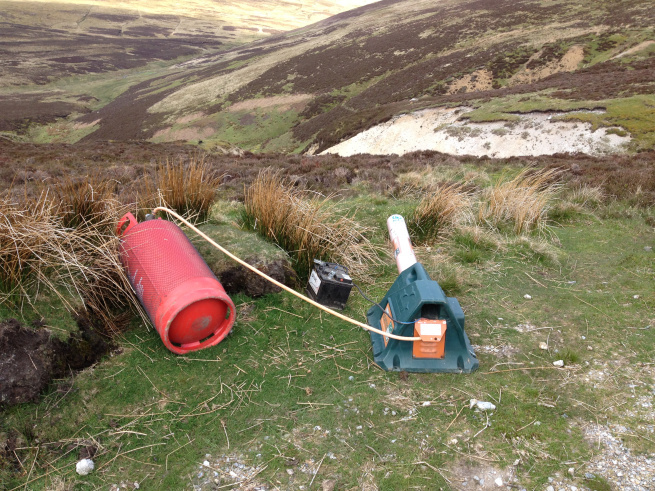 This device was used effectively on the Croglin estate and on the Leadhills estate this year to scare away breeding birds. 7 comments to Loop-holes being used by many moorland keepers to deter raptors from settling on moorland in Lancashire’s Forest of Bowland:More shocking images. And what would the RSPB warden in Bowland do if he observed a gamekeeper attending one of these grit bins or traps near to an occupied Peregrine site, would he ring the police and try to get a prosecution? Would he simply ignore it like the RSPB did when a gamekeeper with a loaded shot gun was observed and reported for committing armed trespass below a peregrine nest on the United Utilities estate?. Question ??? ?….Bird of prey takes a grouse,as nature intended or not ??? ?, next question ???? ?…..Land owners/Gamekeepers preparing grouse for shooting by humans is this what nature intended yes or no ?????. Is there no possibility artificial nests could be introduced in safe zones where the land owners / keepers could not go?. I’m no expert but would it not be possible to buy some pieces of moorland run by people who would look after them (Government funded as well plus charity).Just a idea but ideas are what is needed if even a small chance of success. This obviously needs a change in legislation. Is there legislation that can be amended or does it need a new bill passed. The gov. online petition could be used to raise awareness of this but I think to be effective there needs to be a plan on how to get signatures quickly as these petitions are time limited. I have a mailing list of 3000 that could be targeted. I would also suggest that you change your language slightly. Commenting that ALL gamekeepers kill raptors is not helpful. I know a couple who don’t. they may be in the minority, but we need to have the good ones on our side. Tarring them all with the same brush is likely to lose support. Editor’s Comment. Andrew, we are not aware that we have said ‘all gamekeepers kill raptors’. If you would kindly highlight where you have read this we will look into your concerns and amend where appropriate. I read that as encompassing all gamekeepers and while you could argue the interpretation it would go both ways. It is something that can slip through while posting and from your reaction you obviously did not intend that interpretation. Keep up the good work it must be very time consuming and if I spot anything else I’ll let you know. Editor’s Comment Andrew, thanks for this, your comments are appreciated. Please keep them coming in. We would like to take this opportunity to remind all our followers, Raptor Politics is not against shooting, we are only anti the illegal aspect, which sadly seems to be getting much worst on red grouse moors where “feudal” laws still seem to apply. Editor’s Comment Steve, we have censored what you had to say in your comment, as the information could not be verified. Steve, the RSPB tried to prosecute myself and another member of the North West Raptor Protection Group last year despite no evidence of ANY wrong doing they still pursued with it,they failed embarrassingly, believe me they would not dare try and prosecute any gamekeeper in Bowland.